$600 I Love Cash Giveaway - Monthly Giveaway (Feb 2013) | Sahrish Adeel - Malaysia based Pakistani Beauty & Lifestyle Blogger! 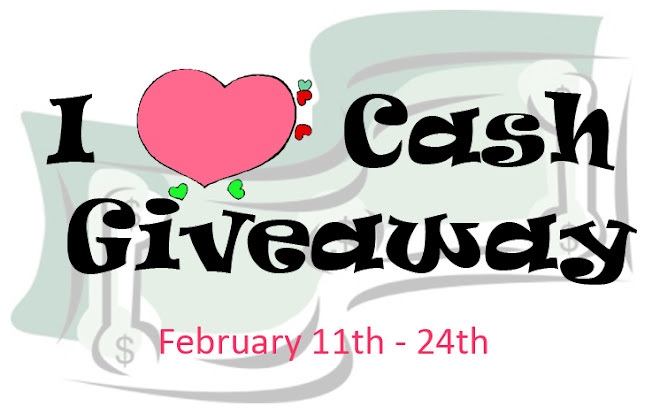 Welcome to the $600 I ♥ Cash Giveaway! This is going to be my this month's giveaway. This giveaway is open internationally. Hosted by Giveaway Promote. We've teamed up with a great group of bloggers to bring you this fabulous giveaway. Three lucky people will win cash! One grand prize of $500 and two other $50 cash prizes are up for grabs. Complete the tasks below to earn entries into this giveaway. Refer your friends using your unique link to earn even more chances to win. Open Worldwide. Ends at 11:59pm EST on February 24th, 2013. If you do not have PayPal services in your country, I am really sorry but you can surely ask a relative or a friend with PayPal services, to participate. Thank you for your participation. Don't forget to subscribe to my blog via email to stay update about monthly giveaways and lots of other fun stuff.